Funny story: When I added Easter Parade to my Netflix queue, I was thinking that I wanted to watch it again, and that I wanted my husband to see it. I had a favorite scene, and I have been trying to expand my musical repertoire to include more Fred Astaire. And then, when we started watching it over the weekend, I found myself thinking, “Huh. I don’t remember this scene.” And then, “Don’t remember this one, either.” And about halfway through, I came to the realization that I had not, in fact, seen very much of this movie at all. Mostly one or two scenes and then perhaps the last third of the movie only. Mind-boggling. I still have no idea why I had previously only seen bits and pieces, nor why I thought I’d seen the whole movie. Despite my confusion, we both enjoyed the movie (for the first time) quite a bit. The story is that of Don Hewes, a song-and-dance man, who is dumped by his long-time partner and girlfriend, Nadine (Ann Miller), who has gotten a starring spot at the Ziegfeld Follies. In a fit of pique (and a little tipsiness), Don declares that he can take any dancer and turn her into something better than Nadine. Enter Hannah Brown (Judy Garland), a mediocre dancer working at a hole-in-the-wall little nightclub. Next thing she knows, she’s been commandeered by Hewes, who tries to turn her into a carbon copy of his former leading lady. Meanwhile, Nadine is chasing after mutual friend Johnny (Peter Lawford), who in turn bumps into Hannah and falls for her. Hannah, however, is in love with Don, who is solely focused on their success as a showbiz team. Success is achieved when Don realizes he has to let Hannah be herself; as a result, he falls in love with her. Nadine, who is jealous of Hannah across the board, attempts to sabotage everyone, but of course, this being a musical, the audience gets a happy ending. Having just written a review for Taxi Driver, I find I have little to say besides “It’s a musical! It’s pretty, and the songs are great, and the dancing is excellent!” The plot’s a little thin, admittedly, but this is an utterly charming movie, and the musical numbers really can’t be beat. How could they, when the talent involved is Astaire, Miller, and Garland? It’s also surprisingly funny, with some excellent banter between Don and Hannah, and a fun cameo by Jules Munshin as a waiter in a snooty restaurant. Peter Lawford is kind of a confusing addition to the mix, but is completely adorable, so you won’t mind. It’s hard to talk about the acting or the plot in a musical, so you just have to depend on the performers being good at what they do, and here you’ve got the best. 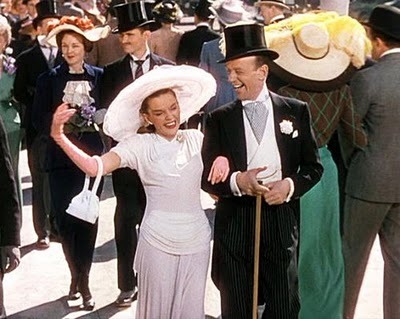 Easter Parade would, in my opinion, be worth it for any of the stars alone, but is a must-watch when they’re all combined. And hey, Easter’s coming up, right? Highly recommended. This entry was posted in Reviews, Weekend viewing. Bookmark the permalink.